Chief Architect X9 introduced a new set of tools that give you a lot more control over the draw order of objects when drawn in the plan view. What this means is that when objects overlap you have complete control over what is visible or not visible. 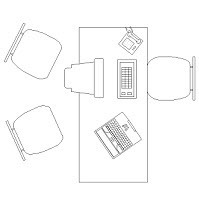 For example if you place a chair that is partially under a table you can control whether or not the entire chair is visible or if only that part of the chair not under the table is visible. The illustration on the right shows a chair partially hidden by the table. With Chief Architect X9 you could make the entire chair visible, even the part of the chair that is under the table. This tip will show you how to assign a draw order to objects so that you can control what is visible or not visible.